Located on the north-eastern tip of the island, Cala de Sant Vicent (also known as Cala San Vicente) is a relatively quiet area with a crescent-moon shaped bay. A Cala de Sant Vicent property is situated in paradise. Previously, it was one of the most isolated locations on Ibiza, so that its inhabitants had to go to the capital town of Eivissa by sea if they wanted to avoid several days of the journey. Today, Cala de Sant Vicent has become a great family holiday resort and second-home destination. It is mainly inhabited by an international crowd and attracts a wide range of visitors from around the world, with the majority being German and British nationals. Cala de Sant Vicent property market includes beautiful Ibicean villas, situated just a stone’s throw away from the bay. An average price for a house in the area is currently Average price per sqm. in Cala de Sant Vicent €7,128 0% properties#: 9 last change on: 19 Apr 2019 €7,128 per square meter. A highly appreciated sea view position adds around a premium value on the top of the average selling price. The most active agencies on the local real estate market are Luxury Villas Ibiza, Gould Heinz & Lang and ImmoAbroad. Why Cala de Sant Vicent property? This area is perfect for those looking to sense the real Ibicencan lifestyle in Ibiza. ”A way of living you need to sense before you die!”, as Leif Borthen (1911 – 1979), Norwegian author & journalist, wrote in his book ”The Road to San Vicente”. You will feel anything but relaxation and calmness at Cala de Sant Vicent because of the holiday getaway atmosphere of privacy created by being in the middle of magnificent green cliffs and steep mountains. It is a general must-do to walk up to the peak of the spectacular cliff lookout to admire the spectacular scenery of the bay below. 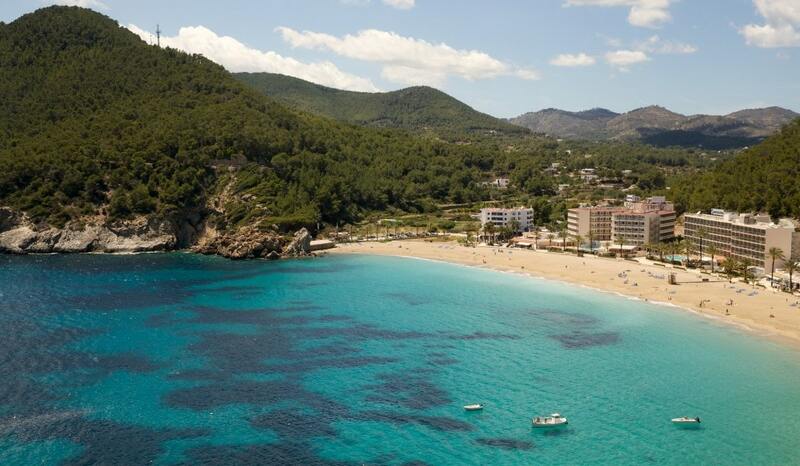 Like numerous Ibiza beaches, Cala de Sant Vicent boasts a curve of white golden sand with amazingly brilliant azure sea. The beach is wonderfully wide and the area is extensive, so even when very busy in peak season it rarely gets overcrowded. With shallow waters and a lifeguard on duty, this is a good place for children and less confident swimmers as well. The popular water sports opportunities here are countless, including the windsurfing school. Marine conditions and seabed are perfect for anchoring a boat on a sandy sea bottom and shelter from the wind that flows from the north and west. In case you are looking to enjoy sunbathing in fullest privacy, Ses Caletes is one of the few still undiscovered beaches where you can enjoy serenity at its finest. This blissful hideaway, where tourism hasn’t yet eclipsed the local culture, is located just 5.7 km from Cala San Vicente. The beach area is backed by a small palm tree-lined promenade peppered with plenty of bars and resort-style eateries to choose from. With some traditional seafood restaurants and a number of quirky and hippy-style cafes, there is something for everyone. However, a couple of places deserve a special attention, ”Hidden” and ”On the Beach”, which are ones of the favourite dining spots in the north for many. ”Hidden” serves cracking cocktails and ”On the Beach” offers a fantastic organic burger. Not far from the beach area you will find the tiny village of Sant Vicent de Sa Cala, the smallest on Ibiza. It comprises just a handful of houses, and there are no sights except for the charming church with a double-arched porch and an attractive setting in its own little plaza, with a solitary palm tree for a company. Around two hundred meters downhill from the church is the village’s only other feature, an orderly small bar Es Café, which also functions as the post office and shop. There are plenty of outdoor activities you can do in the area, such as trekking, and even horse riding is available. From here, you can easily reach the small Tagomago Island, which lies just off the coast. This private island is one of the most privileged and beautiful in the Mediterranean. It is ideal for those, who wish to enjoy total luxury and privacy and have an access to the range of excellent services. On its west coast, you find a beach with mooring and bar as well as great options for all kinds of water and outdoor sports, from hiking and bird-watching to swimming, scuba diving and yachting. Cala San Vicente is quite isolated from the larger locations but is conveniently accessed and takes a 10-minutes drive from the centre of San Juan de Labritja and 20 minutes from Santa Eulària des Riu. In 40 minutes you reach the international airport and jet-set centre of Ibiza town with its restaurants, parties and culture.